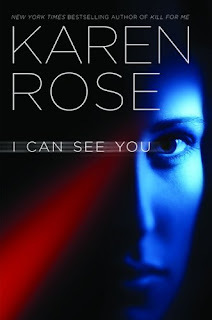 Thanks to Miriam Parker @ Hatchette Books, I'm able to give away 3 copies of the fantastic book, I Can See You by Karen Rose. Deadline August 13th @ 11:59 PM Est. I am a follower and I posted a link to your contest on my sidebar. Does that count? I am a follower and would like to win this book. My birthday is November 21. Sounds good. I'm already a follower! i'm not entering 'cause i have 3 of them already but! my birthday is aug 11 and i have decided the entire month is a celebration of me!!! +1 Already told you my birthdate. I believe I told you my birthdate - if not it's 2/29/68. I'm a new e-mail subscriber. Hey Jenni I'd love a chance to win this book. I love her books! Thank you for the giveaway! I would be very interested in reading this book. Please enter my name in your draw. Thanks. I've read good things about this book! This book sounds so good. Karen Rose is one of my favorite authors. Would love to read this one. Please enter me. Thanks! I want to win this book!!! !